B U B B L E G A R M: Body Electrics! I got the nail varnish Prism from this collection and I absolutely adore it! I think that liquid metals are gorgeous (I've got solstice and the golden one) and this looks fab too! I want the Liquid metal so bad !!! and the color you got is the one I adore. Thank you very much :) It is a honor for me to have you as a follower :D Thanksssss I think I will give burnished a try once I have used my bronzer up. Ive spotted Prism on a few blogs now, it looks really pretty, me likes! I'm looking forward to a FOTD with these maybe? 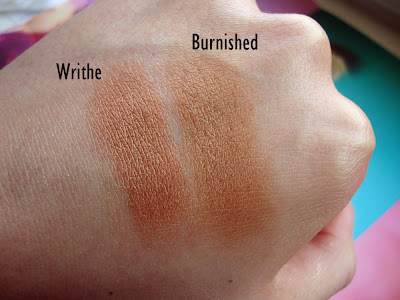 I love the Burnesh bronzer, love the logo thing, looks amazing. Is this as shimmer as the others? I don't like shimmer for day time,most of the days, and have far to many like that, Sirens duo with Writhe is one of them. But their powders are so amazing that I think I need it! JoMina (the lilac nail varnish) is my fave from this collection. It's a gorgeous shade and when i've worn it i've had loads of compliments! I need a new bronzer. I've never really found my match maybe I should look in to these. I have never brought from Illamasqua before. I actually always think of them as the Creative's brand, I don;t know why! ugh i own a liquid metal and hate it. it crease so so much no matter what i do. I like the look of that body oil! I didn't even know they had a new collection out!